A traditional list (of words) has been handed down (to us). It is to be (here) explained. This same list is called Ni-ghaṇṭavas. From what (root) is (the word) Ni-ghaṇṭavas derived? They are words quoted from the Vedas (ni-gamāḥ). Having been repeatedly gathered together from Vedic hymns, they have been handed down by tradition. Aupamanyava holds that, as these are the quoted words of the Vedas, they are called Ni-ghaṇṭavas on account of their being quoted (ni-gamanāt). Or else (the word Ni-ghaṇṭavas) may be (so called) from being fixed only (√han), i.e. (a list, in which) they (the words) are fixed together, or collected together (√hṛ). Now, what (are) the four classes of words? They are the following: noun and verb; prepositions and particles. With reference to this, they thus prescribe the definition of noun and verb: the verb has becoming as its fundamental notion, nouns have being as their fundamental notion. But where both are dominated by becoming, a becoming arising from a former to a later state is denoted by a verb, as ‘he goes’, ‘he cooks’, &c. The embodiment of the whole process from the beginning to the end, which has assumed the character of being, is denoted by a noun, as ‘going’, ‘cooking’, &c. The demonstrative pronoun is a reference to beings, as ‘cow’, ‘horse’, ‘man’, ‘elephant’, &c.; ‘to be’, to becoming, as ‘he sits’, ‘he sleeps’, ‘he goes’, ‘he stands’, &c.
If you are not able to read the Telugu content properly please follow the following steps. If you see boxes, rounds, junk characters instead of Telugu fonts, or sometime you may see Telugu content but 'ottakshara' are not coming properly follow the step 1. Download pothana2000.ttf font or Vemana.ttf and paste in FONTS folder. 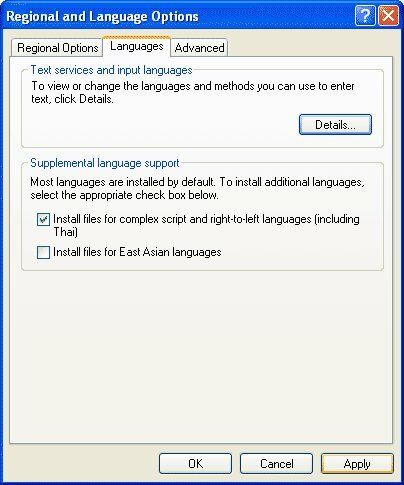 Go to Start > Settings > Control Panel > Regional Options > General [Tab] In the "Language settings for this system" frame, check the box next to "Indic". 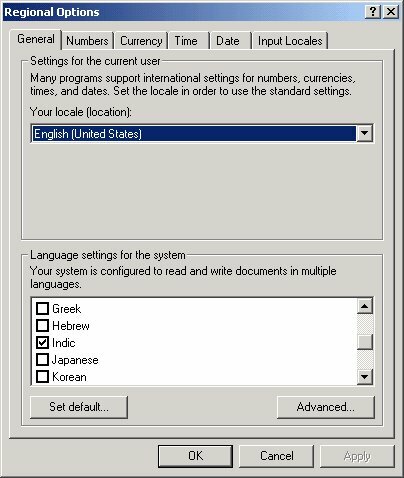 Copy the appropriate files from the Windows 2000 CD when prompted. If prompted, reboot your computer once the files have been installed. The above steps should fix the problem. If it still doesn't, please write to us at dictionary@andhrabharati.com with the browser version, OS version and the problem you are facing. Open the page which has the problem. Select Print Screen key to take a snapshot. Open a Word processing software like Word and paste (Control-V) the snapshot"
Save the image and send it to us. Copy one of the Telugu fonts file from Telugu Fonts (we recommend vemana2000.ttf font) to .fonts directory in the user's home directory. If .fonts directory does not exist in the home directory, please create it. Finally run the command 'fc-cache' from the command prompt. It is very important to restart the browser, then only you will be able to read the content in Telugu. In Mac OS X 10.4, if you are using 'Safari' web browser, no need to do anything. This will fix almost all the problems. If you still have any problems contact us with the browser version, OS version and the problem you are facing. The following is our wish list of Sanskrit dictionaries to be added to the search. As this is a gigantic manual work, there are bound to be errors (omissions/ mistakes etc.) and the users are requested to use the "report error" link, provided at every word, to inform us the errors. The reported words will be verified and corrected. We request volunteers' support in digitizing and proofing so that more dictionaries could be added to the search at a faster pace.